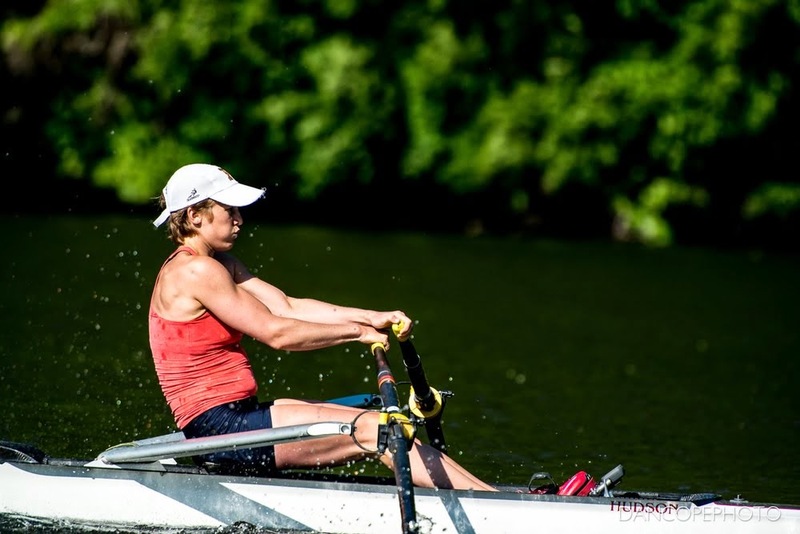 Last week, I raced the open weight double at the second Spring Speed Order event hosted by US Rowing. Rosa, my doubles partner, arrived Monday morning, giving us just four rows together before the first race. We had rowed together once in January, on a 35 degree Florida day featuring 20mph winds. We knew we matched well, but also had a lot of work to do. The first session was a good indicator. We took a series of 10s and 20s at increasing rate and felt good up to stroke rate 28, when things started to tense up. Not bad for a first outing. Our second session involved some longer work at race pace (start 250m, base 1km, finishing 250m), which was also promising, but again featuring that tension at the higher rates. We also seriously botched our pacing, heading out way too fast on the 1km piece. That's not surprising: both of us have spent a lot of time in singles recently and pacing a double is pretty different. Our remaining sessions in the boat were easy paddles, working to find our rhythm and where we were most likely to mismatch. Originally, the time trial would have seeded us into semi-finals, but two late scratches to the event meant the time trial was just a race for lanes: all boats would progress directly to the A-final. We wanted to put together a fast race, but more importantly we wanted to put together a solid piece. After our poor pacing earlier in the week, we decided to treat this race as a builder, starting at a lower stroke rate and slightly slower pace and building over the 2000 meters. This resulted in a relatively slow time, but allowed us to find a good racing rhythm. Our last 500 meters were strong and fast. This was my first trip down a 2k course in bow seat of a double, and I was terrified that I would botch it. I've never been comfortable with my skills at matching. This piece gave me a lot of confidence, though. It wasn't quite magic, but we were very in sync. We still had some of the tension we felt during the practice pieces, but that was a manageable error. During the one practice window between the time trial and finals, we made really good progress on relaxation. We especially focused on coming off our starting sequence relaxed. I also needed to be more aggressive in the first 500 meters of the race. I've lost a lot of races in the first quarter, afraid the pace was too hot. So that was the goal: make the first 500m aggressive and relaxed, then reassess the situation. We got off the line really cleanly, and were actually right with the pack. Our rhythm was relaxed and I was going way harder than I thought was appropriate, so everything was on track. We came through the first 500m just under 1:50, a very solid pace given the headwind. We were still in contact with the back of the pack, and we held that through the 1k mark, splitting 1:53 for the second 500. Going into the race, we knew it would be very challenging to stick with the rest of the field. 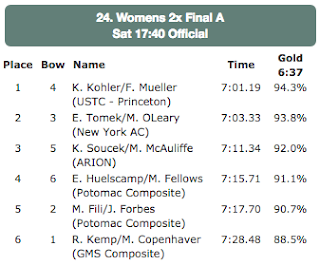 Our race featured some of the best open weight scullers in the world (and ultimately, some of the fastest times of the day). On top of that, both Rosa and I are lightweights, and while neither of us were prepared to weigh in for this race, we were still much smaller than our competitors. Difficult under normal circumstances, the addition of a 6-7mph headwind put us at a serious disadvantage. Contact at the 1k mark was really good. Then sh*t got real. Physically, we were still pretty ok: in pain, but tolerable. What we didn't expect was the wake. With two doubles duking it out 15-20 seconds in front of us, we got sucked into a wake so big we thought a motorboat had gone by. The boat was getting slammed from one buoy line to the other, and the splits would rise and fall as we sunk into troughs and rode crests. The brunt of the wake hit us in the third 500, also the most difficult portion of the race mentally. We came through in 1:54. By the last quarter, things had smoothed out a bit. We could still feel the wake, but we weren't reeling in it. Our plans for a lift at 800m to go hadn't really panned out, so we hit the gas at 400m to go, accelerating through the line. Final 500m time was 1:52. We were far off the back of the pack by the finish line. But the winners' 94% of world's best time was an exceptionally fast result for the day. 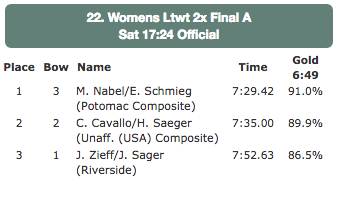 The next fastest winner (in the women's pair) was 91.4%. In addition, our time was very solid compared to the lightweight doubles. Obviously, we didn't earn the right to line up next to them by weighing in and I know that being that light would have affected our finish time. Still, it's exciting to move boats fast. I'll be continuing with my current training block, working towards Senior Trials in the lightweight single in early July. My first three weeks were a low rate, base-building phase. (Yes, I raced a double off of three weeks of exclusively low-rate work. It was... exciting.) The next four weeks, I'll be working mid-rate, trying to add a layer of fitness and some confidence in my boat skills. At the end of that mini-block, I'm planning to test my speed at the Schuylkill Navy Regatta on June 16th. The last few weeks, I'll be doing race-specific work, including a lot of short pieces at or above race pace, and a few 2k time trials here at GMS.